There’s something special about tuning in to an inspirational podcast while gazing out of the window during a long plane, train or car ride. Travel (in general, not just while in transit) provides the space to pause and soak in new ideas. 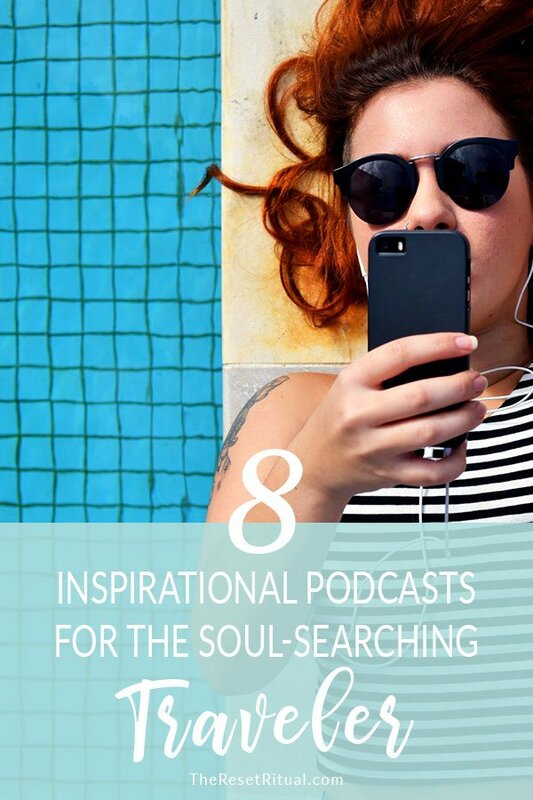 So the next time you’re on a soul-searching trip, or just need some new motivation, hit download on a few of these. If you’re a bit of a rebel, an unconventionalist, a forge-your-own-path type of person, this podcast will give you plenty of thought-provoking material to ponder over your travels. From psychology to science to productivity, these interviews dig deep into what it means to live an unmistakable life. Ready to live the life you truly want to live? Jess Lively is a world traveler and conscious living advocate. Her podcast focuses on following your intuition, law of attraction, manifesting and more “woo-woo” topics done so in a down to earth way. If you’re into that kind of thing, or simply open to new perspectives, this podcast is worth hitting the subscribe button. Sometimes you just need a quick tidbit of inspiration instead of an hour-long podcast. Enter Optimal Living Daily. The host reads popular personal development blog posts, each lasting about 10 minutes. The short episodes are perfect for listening as you’re getting ready in the morning or just before drifting off to sleep. On the other hand, you may want to sink into some meaty material. In that case, Tim Ferriss’ super popular podcast is the way to go. Tim’s in-depth interviews with world-class performers aren’t just inspiring, they’re educational and actionable. Curiosity is a great teacher, and Tim might be one of the most curious people out there. You’ll definitely learn a thing or two. Just like here at Wanderwell, The World Wanderers podcast is about much more than travel itself; it’s about how travel can help you live your best life. Ryan and Amanda, the couple behind the weekly series, interview travelers of all kinds to bring you inspiration far beyond what to do and see in a destination. Simplifying. Slowing down. Giving up the glorification of busy-ness to lead a more meaningful life surrounded by what truly matters. There’s a reason slow, intentional living has become a super hot topic these days; it’s necessary in today’s world. If you want to bring more slow into your life, this is the podcast for you. Dan Harris is a former NBC news anchor who famously had a panic attack on-air, an event that led him to meditation, and eventually, a book and podcast on the topic. This podcast is centered around how to take steps toward becoming more enlightened, while still being ambitious. It’s a great listen for those pondering the bigger picture and how to embrace mindfulness in everyday life. Melyssa Griffin, best known as an online marketing guru, has shifted into the podcast space to raise the question: what does it mean to live a meaningful and fulfilling life? The episodes bounce between business topics, personal development, wellness, and spirituality. A great listen if you’re thinking of starting your own business, or how to strive for work/life balance. Did I miss any of your favorite inspirational podcasts? Let me know!